Argos, Mycenae, and Tiryns are close geographically and in the sagas confused. Argos itself was associated with Thebes and Corinth, and its myths reflect its contacts with the Levant and Egypt. Argos was the most important center on the Greek mainland for the worship of Hera. Its founder, PHORONEUS [for-roh'ne-us], decided in favor of Hera in her contest with Poseidon for divine patronage of Argos. In anger, Poseidon dried up the Argive rivers, including that of the river-god INACHUS [in'ak-us], or INACHOS, father of Phoroneus. Argive rivers since then have always been short of water. Abas had twin sons, Proetus (who became king of Tiryns) and ACRISIUS [a-kris'i-us], or AKRISIOS (who ruled Argos). An oracle foretold that the son of DANAË [da'na-ee], the only child of Acrisius, would kill her father. Acrisius shut Danaë up in an underground chamber, but Zeus lay with her, entering in the form of a shower of gold. Their child was PERSEUS [pers'e-us], whom Acrisius discovered after four years from the noise the child made by playing. He placed Danaë and Perseus into a chest, which he put into the sea. It floated to Seriphos, where it was found by DICTYS [dik'tis], or DIKTYS (brother of POLYDECTES [pol-i-dek'teez], or POLYDEKTES, king of Seriphos), who rescued Danaë and her son and gave them shelter in his home. Meanwhile, Polydectes loved Danaë, who refused him. He ordered the men of Seriphos (including Perseus, now grown) each to give him a horse. When Perseus said, “I can as easily give you the Gorgon’s head,” Polydectes ordered him to perform this task, expecting to get rid of them. The Graeae and the Nymphs. Hermes and Athena advised Perseus how to perform the task, telling him first to go to the three GRAEAE [gree'ee or greye'eye], or GRAIAI (daughters of Phorcys and Ceto, children of Pontus and Ge) and sisters of the Gorgons, who between them had but one eye and one tooth. Perseus got hold of the eye and tooth, and gave them back only when the sisters told him the way to certain (unnamed) nymphs who possessed three magic objects. From the nymphs Perseus obtained the Cap of Invisibility, a pair of winged sandals, and a bag (kibisis [ki'bi-sis]). Hermes gave him a scimitar. The Gorgons and the Beheading of Medusa. Thus equipped, he flew to the GORGONS [gor'gonz], who lived on the edge of the world (usually located in North Africa or in the far north, in the land of the Hyperboreans). Two of the Gorgons (STHENO [sthen'oh] and EURYALE [you-reye'a-lee]) were immortal; the third, MEDUSA [me-dou'sa], or MEDOUSA, was mortal. Those who looked on their faces were turned to stone. Guided by Athena, Perseus, looking at the Gorgon’s reflection in his shield, beheaded Medusa and put her head in the kibisis. Medusa had been loved by Poseidon, and from her body sprang their children, CHRYSAOR [kreye-say'or] (“golden sword”), and the winged horse, PEGASUS [peg'a-sus], or PEGASOS. Chrysaor became father of Geryon (see MLS, Chapter 22), and Pegasus played an important role in the saga of Bellerophon (see MLS, Chapter 26). When the hoof of Pegasus struck Mt. Helicon (in Boeotia) the fountain HIPPOCRENE [hip-po-kree'nee], or HIPPOKRENE, “Horse’s Fountain,” gushed forth; it was sacred to the Muses and associated with poetic inspiration. 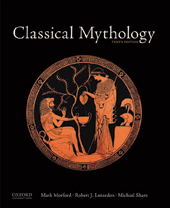 Athena invented the flute for Medusa, imitating the lament of the two surviving Gorgons, Stheno and Euryale. Atlas. Perseus, wearing the Cap of Invisibility, escaped from the Gorgons and began his flight back to Seriphos. Medusa’s blood dripped through the kibisis as he flew over Libya, and from it sprang the poisonous snakes that were said to infest Libya. The titan Atlas, who supported the heavens (see MLS, Chapter 4), refused hospitality to Perseus, who turned him into stone, now the Atlas range of mountains. When Perseus came down to the seashore to bathe his hands in the sea, the seaweed upon which he placed the kibisis hardened into coral. Perseus and Andromeda, by Titian (ca. 1487-1576). Andromeda. Flying past the coast of the Levant (or, some say, Ethiopia, that is, the part of Africa lying to the south of Egypt), Perseus saw a young woman chained to a rock, threatened by a sea monster. She was ANDROMEDA [an-drom'e-da], daughter of King CEPHEUS [seef'e-us], or KEPHEUS, and Queen CASSIEPEA [kas-si-e-pee'a], or KASSIEPEIA. Cassiepea had boasted that she was more beautiful than the Nereids, and Poseidon punished her pride by flooding the kingdom of Cepheus and sending the sea monster to ravage it. The oracle of Zeus, Ammon, told Cepheus that he could appease the monster only by chaining his daughter to the rock. 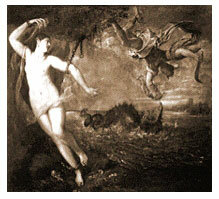 Perseus killed the monster with the scimitar of Hermes and was rewarded with Andromeda as his wife. Phineus. Since Andromeda was already betrothed to PHINEUS [feyen'e-us], her uncle, Perseus had to assert his claim by fighting Phineus and his followers, all of whom he turned to stone with the Gorgon’s head. The fight between Perseus and Phineus was described by Ovid as a full-scale battle in the dining hall (like that of Odysseus) in Metamorphoses 5.1–209, narrated at great length and with much ingenuity. The Return. Perseus and Andromeda flew back to Seriphos, leaving a son, Perses, to inherit the kingdom of Cepheus. At Seriphos Perseus found Danaë and Dictys being threatened by Polydectes, whom he turned to stone. Leaving Dictys as king, he returned to Argos with Andromeda and Danaë (whom he had released), and gave the winged sandals, the kibisis, and the Cap of Invisibility to Hermes (who returned them to the nymphs), along with the scimitar. To Athena he gave the Gorgon’s head, which she placed in the middle of her aegis or shield. The Killing of Acrisius. Acrisius fled from Argos to Larissa (a city in Thessaly) to avoid Perseus. Perseus followed him there and took part in funeral games being celebrated for Abas, father of Acrisius. In the discus-throw, his discus accidentally killed Acrisius, and so the prophecy of the oracle was fulfilled. Perseus, as the killer of his grandfather, could not return to Argos and went to Tiryns, where he became king, exchanging his kingdom with the king of Tiryns, Megapenthes. He founded Mycenae, and from him and Andromeda descended the kings of Mycenae in the generations before the family of Atreus. From them also descended Heracles and Eurystheus (see MLS, Chapter 22). Inachus, Io, and Epaphus. Inachus, father of Phoroneus (see above), was son of Oceanus and Tethys and is sometimes said to be the founder of Argos. He gave his name also to the river Inachus. His daughter was IO [eye'oh] (see MLS, Chapter 4), who was loved by Zeus and changed into a cow, resuming her human form when she came in her wanderings to Egypt, where she gave birth to Epaphus. Hera persuaded the Curetes to kidnap EPAPHUS [ep'a-fus], or EPAPHOS, and Io, after searching through many lands, found him in Syria. After her return to Egypt she was worshiped as the goddess Isis (see MLS, Chapter 16). Epaphus and His Descendants. Epaphus was identified by the Egyptians with the sacred bull, Apis. In the mythology of Argos, a son of Phoroneus was also called Apis, from whom came the ancient name for the Peloponnese, Apia. The daughter of Epaphus was Libya (from whom the geographical Libya is named), whose twin sons were Agenor and Belus. Agenor, who became the ruler of Phoenicia, was father of Cadmus and Europa (see MLS, Chapter 17), while Belus ruled in Egypt. Aegyptus and Danaüs and the Danaïds. The sons of Belus were AEGYPTUS [ee-jip'tus], or AIGYPTOS, and DANAÜS [dan'a-us], or DANAOS, who quarreled. Danaüs left Egypt and came to Argos, where he became king: his subjects were called Danaï, which is one of the names that Homer uses for the Greeks. The fifty sons of Aegyptus demanded the fifty daughters of Danaüs (DANAÏDS [dan'aidz]) in marriage; on their wedding night, forty-nine Danaïds stabbed their husbands with daggers given them for the purpose by Danaüs, and for this were punished in the Underworld by having to fill perforated water jars. The fiftieth, HYPERMNESTRA [hi-perm-nes'tra] spared her husband LYNCEUS [lins'e-us], and from them descended Abas, the great-grandfather of Perseus. Amymone and Poseidon. The Danaïd AMYMONE [a-meye'moh-nee] was loved by Poseidon, who with his trident caused water to gush from a rock: this is the spring, Amymone. Their son was Nauplius, founder of Nauplia and father of Palamedes. Nauplius, to avenge his son’s death at the hands of Odysseus, caused many ships of the Greek fleet to be wrecked on the rocks of Euboea during the return voyage from Troy (see MLS, Chapter 20). Other Argive heroes were Melampus (see MLS, Chapter 25) and the five Argives among the Seven against Thebes—Adrastus, Amphiaraüs, Capaneus, Hippomedon, and Tydeus (see MLS, Chapter 17). The son of Tydeus was Diomedes, a leading Greek hero in the Trojan War (see MLS, Chapter 19).